The complexity of communication is beyond exasperation. We are faced with a living scenario where the intelligence of the members of the human community must adapt a type of cognitive capacity that can engage with mediated information in useful ways to decipher potentially meaningful, interesting or dangerous material. To avoid simply absorbing and regurgitating constructions and accidents of information frenzy, we need to devise and foster methods of idea processing to recombine and evaluate functional idea structures. We don't know what we are. We know nothing with absolute certainty, and it is likely that uncertainty is an essential factor of our existence. So, it makes sense to accept our inevitable state of uncertainty and proceed with fuzzy ontological explorations and speculations making the best of the tools that are available. The word idea is a placeholder for something like an increment of consciousness. 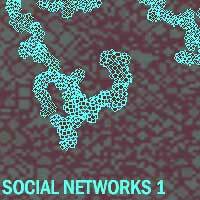 And network is an attempt to imagine a model where consciousness is a continuous complex interactive dynamic structure. The word consciousness, rather than mind, implies that what we call ideas or concepts are not removed from phenomenal reality and they are not limited to literal mental language structures or brain function. In this context, consciousness indicates that a mind/body dichotomy is inappropriate. Consciousness recognizes the structures of biological and cultural information as two approaches that address the same substance. And it reads the vocabularies of sciences and arts as different languages discussing the same stuff. The use of the term consciousness as idea provides the human entity with a more open definition in which physical, sensual and active experiences are combined with the cognitive processes. Understanding that the synchronicity of idea and experience is evident and reasonable indicates an environment where concepts and objects are substantially cohesive. Calling ideas conscious and defining a conscious entity as body/mind, material/imaginary, or phenomenal/noumenal contradicts some classical categorical boundaries. It questions classic philosophical assumptions defining the relationships between the human unit, the human community and the cosmic environment. We need not forget all we have learned in various cultural and historic traditions. Designating reason as ruler over ideas on one side of the room and ruler of actions on the other is useful in some circumstances. But we also need to remember that this is just one more fuzzy way to arrange the composition. Human knowledge resides and functions, as flexible existence/experience of consciousness. The characteristic of consciousness, as combined essence/existence, nature/nurture or form/content, remains present in human group structures. And understanding experience as an integral part of the idea network dialogue forces the recognition that behavior and consciousness are incessantly reciprocally influential. All groupings of humans are entwined with interconnected idea structures. Families, communities, societies and cultures are social idea networks in the same circumstances that they are defined as any other sort of group entity. Declaring The Universal Truth is a shaky proposition. Even those who want to embrace an idea of absolutes generally agree that any attempt to describe them is at best fuzzy. We recognize that the observer is a part of the observation and that different observers and knowledge structures exist. We can also recognize that dualities are tools not solutions. And uncertainty does not mean absence knowledge. Perceptions and ideas about identity in relation to social and ontological concepts may be informed by contrasts such as human and environment, individual and universe, or nodule and network. Contrasts are a fundamental aspect of our ability to perceive and make sense of things. Designating or identifying perceived or imagined extremes serve to arrange a spectrum of variations between them. Self and other give us a spectrum to identify elements of community or social structures. True and false name basic oppositions in logic and science. In ethics, good and bad can be useful. But classic isolation of conflicting and competing oppositions may be replaced by different ideas and traditions where oppositions represent a spectrum of interconnected relationships not a war between extremes. The oppositions are guides for idea structures rather than ultimate goals. Wrong is not necessarily the opposite of right and we don't have to be right in order not to be wrong. An alternative spectrum of contrasts is exemplified neatly by looking at light and color. Chromological structuring in a red, green, and blue light environment engages a different system than that of red, yellow and blue mineral pigments. Both systems arrange values of tint and shade between the limits of dark and light but the systems are based on thoroughly different structures. There are contexts of relationship between the systems. For example we can produce a conversion of an image. The reproduction will translate some elements and transform others. So, we evaluate the systems in relation to which works best for a given project or activity. It would be absurd to say RGB is better than RYB in general, because the value judgements are determined in relation to functionality. Another description of useful opposition is illustrated by binary systems. On/off switches represented algebraically by 1 and 0 enable complex structures to be developed. Branching paths of options and possibilities facilitate the emergence of unlimited patterns in diverse modes of coherence. And elegantly, the ability to imagine binary algebra is as significant to the construction of an electronic digital system as sand and heat. What is metaphor when every idea structure is involved with phenomenal process and all phenomena has an idea component? Knowing nothing for certain does not hinder the building of structures of knowledge. And accepting that knowledge structures are fuzzy does not make knowledge structures obscure or remote. Fuzziness or uncertainty is an attribute we may put in place as a guide to guard against the immobility or stagnation of consciousness on a narrow channel of any given strand. In experience knowledge structures are evidently plentiful. Along the branches of human idea-netness, ideas have congealed in a variety of categories and disciplines. We can recognize the usefulness of setting up contrasts, categories and sub categories, remembering that these delineations are tools rather than actualities. In order to follow a meaningful strand of the idea network we locate a point and move out from it, or we designate a grouping and work within it. Some traditions of knowledge structure about knowledge are called mythologies, philosophies, sciences and arts. More modern categorizations break into specialized paths like linguistics, media and genetics. But the form/content of categories change identities and affiliations and as they branch they also reconnect and cross paths. Like the Persians, Greeks, Romans and Victorians we consider ourselves advanced. Science seems to be the most venerated contemporary category of knowledge structures. Sharing a classical ancestry with philosophy, science has prestige in the idea net environment. But, physicists contemplate consciousness, biologists recite autopoetics and everyone wants to be an information theorist-- or artist. Chaos and complexity bubble and boil. Swirling and streaming, webbing and netting, bustling, blowing, huffing and puffing-- it is an idea network. As entities amidst it, as a part of it, we surf or steer, plot or decipher a course, locate an identity and act. We could say that language is the fiber of a net of ideas. And language includes all types of communication, or information transfer, structures. For example there are languages of mathematics and sciences as well as languages of arts and machines. Language systems like knowledge are uncertain or fuzzy, but despite their imperfections, as tools of contemplation and communication they are also robust, useful and fantastic. If language is thread then the weave is story. Myths and rituals are in league with the arts as methods and traditions of information system/structures that engage with non-literal experiential ideas. Myths or stories are vehicles of knowledge network transmission. In many traditions myth, ritual and the arts have evolved methods of handling challenges to comprehension in functional and coherent ways. Archives of cultural idea histories contain a luscious assortment of idea structures. For example, endless organic branching consciousness is not a new visualization of knowledge structure. A network is basically a version of tapestry or tree-of-life ideas that identifies reality functioning as an organic, ubiquitous fabric of complex interwoven branching paths. Various strands of idea information, myth/ritual and language/thought, science/technology and arts/theory may evolve as random emergent systems. But, more often, ideas are engineered. Understanding ideas as an interconnected experience of consciousness invites the need to understand the steering device in the cybernetics of ideas. Ideas are entwined with feeling bodies since ideas include an essential element of human physical and emotional experience. So, inflicting pain or pleasure as punishment or reward for nurturing or perpetuating certain ideas will certainly influence choices of ideology. If a person feels pain or pleasure in association with a thought this will influence how that person relates to the thought. Controlling physical and emotional environments controls ideas. And controlling ideas controls behavior. So, social/conscious systems are in bed with political/economic systems. Analyzing the artifacts of ideas, or information structures, is a method of understanding ideas as tools of influence, compliance and control. Ideas need incentive to perpetuate. Usually construction takes motivation and work so we need to ask why an effort to perpetuate and idea is initiated, what region of ideas is it related to, and which entity is served by its perpetuation? Advertisers, dictators and emperors understand the value of jingles, slogans and/or invisible magic thread. And ideas that are unmanaged commonly wiggle around in net-- mixing, merging and meshing with so many divergent tangents that a synthetic process, rather than replication, is necessary to establish a coherent transfer or propagation. Synthetic recombination versus sterile replication designates an contrast for a potential spectrum to consider ideas related to creative/genius and destructive/idiotic. It is significant to evaluate the intent relating to any given information transaction. Both people who design and those who commission arts, slogans and other media are situated within a confined location on the idea network. We need to comprehend the environment of ideation. And, to develop a steering capacity for avoiding destructive collisions, we must function in complexity and also determine meaning. It doesn't matter if the meaning is deciphered or established. Either way. We choose. The attraction to one idea and repulsion from another is glued to human experience, because reward and punishment are main steering mechanism in the cybernetics of consciousness. If one wants to impose an idea threat and coercion are the most expedient methods to use. The idea will stimulate gain/pleasure or its rejection will result in a loss/pain. Clear obvious ideas such as, "the biggest and strongest will win," leave us to contemplate why the fuzzy, oblique ideas exist at all. A compelling question of consciousness is why do we resist the obvious. Idea structures, like cooperation, democracy and mutual benefit, are difficult and inefficient. The reward is seldom significant. So, why does the idea network process irrational fuzzy ideas of truth and justice, freedom and rights, or arts and philosophies? Is there actually an invisible largeness and strength to these ideas or do we just decide there is? Approaching ideas as information or data allows an opportunity to consider patterns and trends of idea structures. And allowing ideas to have abstract representation offers a potential methodology for analyzing systems of ideas without getting stuck on incongruent interpretations and associations. This way we can look at idea structures apart from distracting, and sometimes inflammatory, ideological baggage. Due to the extreme complexity of idea structures this approach may facilitate conversations about consciousness and ontology that cross over discrepancies in vocabularies that continually tangle webs of communication. Chimpanzees modify sticks for termite snacks but humans weave tapestries of idea structures. Setting up dualities and dichotomies and literary oppositions are tools. Visualizations are tools. The development of tools or technologies demands a specific type of human activity that is imbedded with intentional functionality. So, the net of ideas devoted to utilitarian technological progression is inevitably intertwined with the net of human cognition and desire. Tools and technology are part of an idea/material singularity. They are extensions and productions of consciousness. We develop tools to facilitate survival, but identifying what facilitates survival is in constant flux. Communication devices that facilitate information processing, transfer and memory are tools that are imagined to maintain, perpetuate or enhance survival. The artifacts of human civilizations show that humans have devoted work, time and energy to vessels and systems of information for a long time and in many cultural settings. In other words, the arts are technologies along with other idea carrying languages engaged with information processing, transfer and memory. The Arts facilitate human idea networks. They are instruments of idea information manufacture or manifestation. Awareness may not always be activated, but nevertheless, works of art are records of human experience, feeling and thoughts. In this they are particularly well suited to handle non-Cartesian idea structures. Identifying art as artifact, structure or system that processes, transfers and stores human consciousness data, or cultural information, gives us a way of re-cognizing human history and activity. And it locates art in a legitimate, useful and interesting idea network context. The most popular visualization of networks seems to be circular spots or nodules connected by straight lines. Periodically the circles are shaded with a gradation to make them appear spherical and sometimes the nodules or intersections are represented by another geometric shape. In general the nodules represent end points connected by a line and they may appear in locations where lines intersect. We can not blame this stylization of network visualization on computer graphics because we have ancient drawings where similar diagrams were used to represent similar concepts. How do we visualize some sort of organic fuzzy cybernetic system/structure of intertwined, interactive consciousness blurbs and flows? Imagine vaguely defined entities with no real volume or a substance that are both and neither actual and ethereal. Traces of their ever-changing motion designate links or strands of connectivity traveling direction-less through time and space. And what if we want a visualization or map to be functionally interactive and un-simulated? Uncontrived? The image of an idea network cannot be accurately designed. It can only be alluded to or indicated. A layered virtual reality environment might be fun, but slick. What is a fuzzier more organic diagram-- something with texture and liquid qualities? We might try taking a living conscious entity and have the creature indulge, not contrive, complex tangents of consciousness while physically engaging with some flexible, malleable material substance. A visual representation or mapping of a section of consciousness-net might be a good painting. *"Fuzzy logic is a theoretical system used in mathematics, computing and philosophy which allows theorists and computers to deal with statements which are neither true nor false. It is said that fuzzy logic offers computers the best chance of making sense of what people are thinking and then of reproducing their behaviour." *fuzzy logic -- A superset of Boolean logic dealing with the concept of partial truth -- truth values between "completely true" and "completely false". It was introduced by Dr. Lotfi Zadeh of UCB in the 1960's as a means to model the uncertainty of natural language. Any specific theory may be generalised from a discrete (or "crisp") form to a continuous (fuzzy) form, e.g. "fuzzy calculus", "fuzzy differential equations" etc. Fuzzy logic replaces Boolean truth values with degrees of truth which are very similar to probabilities except that they need not sum to one. Instead of an assertion pred(X), meaning that X definitely has the property associated with predicate "pred", we have a truth function truth(pred(X)) which gives the degree of truth that X has that property. We can combine such values using the standard definitions of fuzzy logic: truth(not x) = 1.0 - truth(x) truth(x and y) = minimum (truth(x), truth(y)) truth(x or y) = maximum (truth(x), truth(y)) (There are other possible definitions for "and" and "or", e.g. using sum and product). If truth values are restricted to 0 and 1 then these functions behave just like their Boolean counterparts. This is known as the "extension principle". Just as a Boolean predicate asserts that its argument definitely belongs to some subset of all objects, a fuzzy predicate gives the degree of truth with which its argument belongs to a fuzzy subset." ** Cybernetics: "(1) The science of communication and control in animal and machine. (2) Perhaps because the field is still young, there are many definitions of cybernetics. Norbert Wiener, a mathematician, engineer and social philosopher, coined the word "cybernetics" from the Greek word meaning steersman. He defined it as the science of communication and control in the animal and the machine. Ampere, before, him, wanted cybernetics to be the science of government. For philosopher Warren McCulloch, cybernetics was an experimental epistemology concerned with the communication within an observer and between the observer and his environment. Stafford Beer, a management consultant, defined cybernetics as the science of effective organization. Anthropologist Gregory Bateson noted that whereas previous sciences dealt with matter and energy, the new science of cybernetics focuses on form and pattern. (3) A way of looking at things and a language for expressing what one sees (Margaret Mead)"
Wendy Angel is currently a graduate student at the CADRE Laboratory.